A four-year-old autonomous drone startup founded by MIT researchers and backed by Silicon Valley’s top investors is finally ready to show off what it’s been building over the past several years. Today, Skydio is showcasing the R1, a drone that boasts what the startup calls “self-flying” capabilities. What this means is that the drone is capable of locking-on to an individual and following them while shooting video and avoiding obstacles. This doesn’t just mean that it can avoid a tree or two while flying through an otherwise open field; the drone can track you while navigating itself through a dense forest or urban environments like a warehouse. I had a chance to see these capabilities in action while running through Jefferson Square Park in San Francisco with the R1 hot on my tail. The drone is alarmingly impressive but there’s something a little unsettling about having an autonomous drone track you down on its own while it avoids tree branches to keep you in its gaze. My dystopian subconscious was more than likely fueled in part by binge-watching Netflix’s Altered Carbon last weekend, but when I wasn’t thinking about getting hunted by the R1, I was marveling at just how capable it was at navigating the world with its 13 onboard cameras as guides. The process of diving into its self-flying capabilities is dead simple. After opening the app, you see the drone’s point-of-view via its 4K 30fps camera, from there you can tap on yourself or another person (even while in a group) and the R1 will identify characteristics about that human shape, be it general appearance, color or size, and begin following. The idea is that you could launch the drone, lock onto yourself, and ski down a mountain while the R1 tracked you to the bottom while capturing 4K footage. It can travel at a maximum speed of 25 miles per hour while maintaining its autonomous bearings, and the battery life is 16 minutes on a charge. The drone has 64GB of onboard memory. 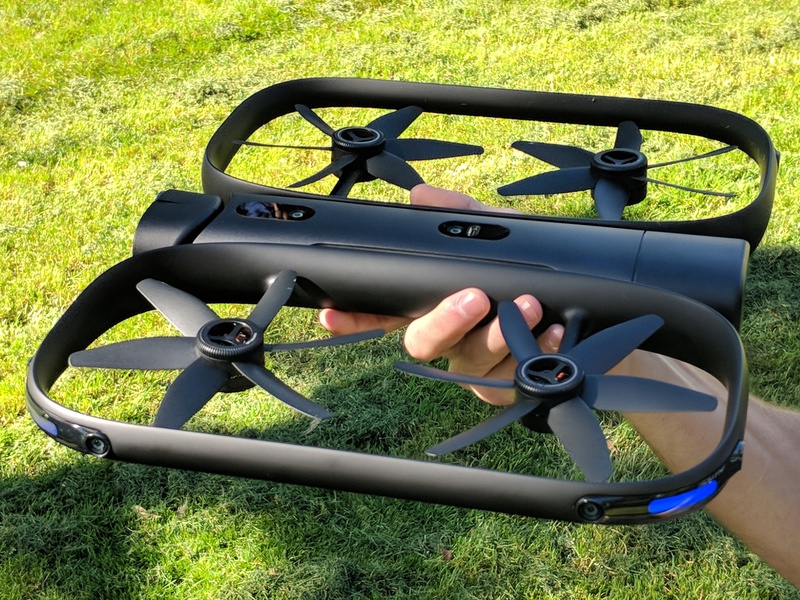 Skydio is hardly the first consumer drone to adopt computer vision-based technologies to enable easier flying, but while DJI and others have used this tech to primarily tackle object avoidance, Skydio has been working to see how the drone can fly itself and track objects. The startup is utilizing many of the same technologies that autonomous car companies have been exploring. The R1’s brain is a 256-core Nvidia TX1 processor, a several-hundred-dollar component already being used in a number of self-driving vehicles. The R1 has a number of flying modes that frame what kind of footage it’s able to capture. The default “follow” mode acts it would suggest, while “side,” “orbit” and “lead” attempt to capture video while maintaining a certain vantage point that can also predict your movement based on your current trajectory. The drone also has some interesting modes like “stadium” which is designed for the specific scenario of capturing field sports. Among all of the specialized modes, the app can also be flown manually (with one hand!) while using the phone app for iOS or Android. These features definitely contribute to an ease of use that would make the R1 ideal for drone novices, and yet the product’s $2499 price point suggests a different audience. “It’s clearly not a mainstream price point,” Skydio CEO Adam Bry told TechCrunch. Right now, Skydio is looking to find an audience of users who are attracted to the idea of shooting footage without needing a separate pilot. Skydio isn’t cementing itself as a consumer tech company with this release and says that they are actively looking at a number of different verticals where commercial drones have seen success including the construction, insurance, farming and security spaces. Alongside the product announcement, Skydio also revealed that it’s recently closed a $42 million Series B round of funding led by IVP and Playground Global. Other notable investors in the round include Nvidia, Accel, Andreessen Horowitz and Kevin Durant. With this round, the company has raised about $70 million to date. The R1 “Frontier Edition” is available for order now on Skydio’s website and includes some extras like an additional battery and propellors.